Our ETSY giveaway goes with the book MATCHED by Ally Condie and is inspired by the compact she receives at her Match banquet which belonged to her grandmother. Generously donated by Etsy seller 2007Musarra. “I have a love of vintage jewelery, every piece is different and I love to look for just the right piece so I can use it in the final product. I search far and wide for just that right piece. My friends love coming to my house just to go through my stash, even my mom has taken to going through everything, she will leave a note like: Hope you don’t mind but…I just, giggle, who can refuse such beautiful things my lovely daughter? As a matter fact when I was a little girl my grandma used to call me gypsy rosealea (who ever she was she must of had some fab jewelery)because I used to pile the jewelery on .Taking pieces from my aunts and adding my own. I would be so weighed down that I could hardly walk!It was the 70’s so add in the high vinyl rust colored boots and silkish shirts and you get the full picture! Vintage, ah what can I say they just don’t make it like that anymore, and clip on earrings who ever invented them well they should have to wear them 24/7 in eternity! I mean really. All us girls know it must have been a man who made those because they would have been more comfortable if they would have to had to wear them, best example: blue jeans!! They made those comfortable enough to work in. Humph. Grandmas jewelery does not have to sit in the drawer any more it can be made into something modern and pretty! Best part is no one else will have my jewelry you will be the envy of all your friends! Description OH this is perfect! Powder your nose in no time flat with this wonderful vintage assembled necklace! The original glass is still there in great shape. The compact is from the 20″ wonderfully made in the USA from Zell 5th Avenue , New York, New York. OH this is a conversation starter for sure or you can help your girls out with your mirror so they can touch up that lip stick!!! The compact is in MINT condition 2-1/2 round. The necklace is 30″ long and vintage very cool and different. Total your entries and leave us the total. Contest ends November 7, 2010 and is open internationally. GOOD LUCK! It’s so cute! 🙂 PLease include me! I think I alreaady said it, but I willl say it again anyway: I LOVE ETSY <3 I have found so many cute things there... Which includides this necklace -- I love vintage things! Oh, and I’m nathaliamonteiro on Etsy :)! That is beautiful. What a great idea! The compact looks so beautiful! 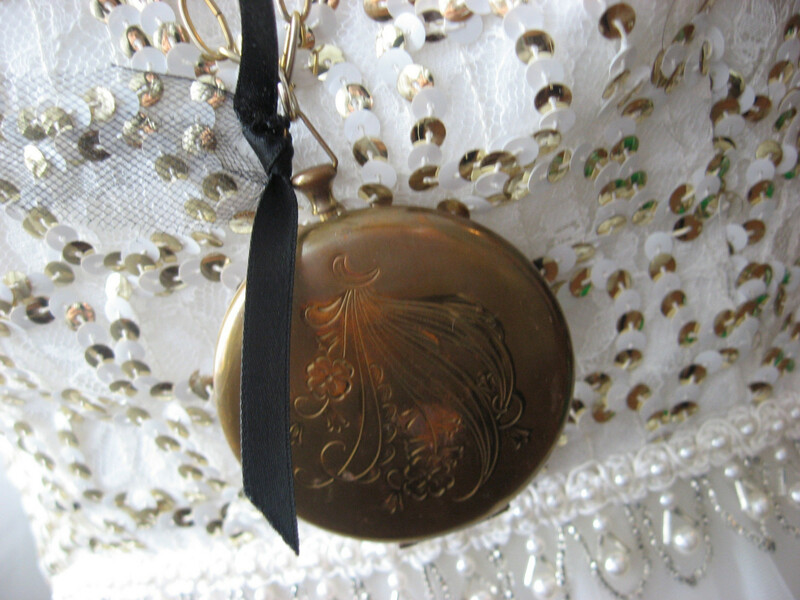 Love the vintage compact, its so pretty!! I want that compact. Its so beautiful. I loved it! Tahnks for making it international! Thanks for the giveaway: The compact is beautiful! I would love to own a locket like this! This locket is absolutely gorgeous, I would be a ahppy to girl to have this pretty jewlery, it would make the perfect statement neclace, I love it! Thanks so much for this contest, its beyond cool! (1) Lovely item you are giving away. I’ve always liked vintage items. (2) Hearted 2007Musarra as bellekhris. I love this compact ! I hope to win it! That compact is so beautiful! The compact is just beautiful. Thanks for the giveaway. Wow. The compact is beautiful! Thanks for the giveaway!